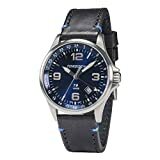 Here are the Best Torgoen Watch Reviews featuring top rated aviator watches with useful user/owner reviews. 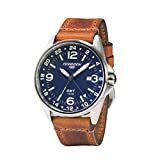 Torgoen watches are the no-nonsense best Swiss made watches for pilots, offering the best looking, tough and value-for-money aviation watches. These stylish and sporty pilot watches offer a challenge to top aviator watch brands in the industry especially being so affordable. It is a daunting task these days to choose the best professional watches for pilots. The market is full of a multitude of watches which call themselves the “best watches for pilots”. 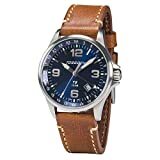 Yet so many of these so called “flying watches” or if you like “pilot watches” look alike and moreover resemble old fashioned aviator watches from a bye-gone era. 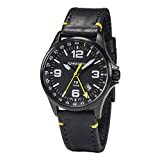 In reality most of them are just wannabe pilot watches when they are in fact just fashion watches with somewhat exagerated larger watch faces. It is precisely for the above mentioned reasons and more, that it is necessary to take out enough time to carefully research the most suitable aviator watches. With such demanding specifications and quality requirements, only a specialist watch company with the expertise to create fine watches should be shortlisted when selecting your new pilot watch. With a sigh of relief Torgoen’s authentic collections of feature rich stylish, tough, complicated and sophisticated pilot watches are perfect for professional pilots. 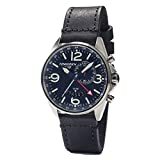 Yes many owner and user reviews bear testimony to Torgoen watches being one of the best watches for pilots made from the highest quality Swiss movement. 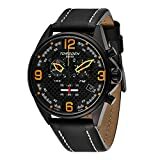 2 How & Where are Torgoen watches made? 3 What is the Torgoen Warranty like? Torgoen watches was founded in 1998 by a group of enthusiastic pilots and watchmakers led by Mr. Benzi Rosenki. armed with a corporate vision to create a top quality collection of wrist watches for pilots that are at the same time functional, durable and affordable. The name “Tor-Goen“, symantically broken down to Thor, the god of thunder in Nordic mythology, and Goen which is a derivative meaning “Go”. So in essence the name symbolises the boldness, functionality and simplicity in design (Thor) in aviation wrist watches (Goen). The founding team have between them gained valuable experience over a number of decades manufacturing watches for the world’s most renowned top watch brands. Torgoen was born when they decided to establish a totally new Brand of their own, which would become known for its good quality, design and affordability. The founding team’s experience and knowledge within the watch industry gave them access to the highest quality components and manufacturers. By careful management of the the manufacturing process and selling directly to the end user, substantial cost savings were achieved which enabled them to provide an industry beating high quality, stylish and functional product at an affordable price. In hindsight this proved crucial for Torgoen watches in becoming so well respected and accepted in the aviation industry. Being Pilots themselves and lovers of everything to do with the aviation environment, their brand aesthetics are inspired by vintage cockpit instrumentation design and layout. Torgoen’s best watches for pilots you will find plenty of amazing features like EB Flight Computers and UTC or GMT Dual Time hands wrapped in a military display. No wonder as the design team is highly experienced and very innovative as exemplified by their many ergonomic designs achieving high visibility and readability using simple and straightforward design. This principle has become the signature trademark appeal for the Torgoen watch brand. The highly focused and motivated Torgoen team instinctively continue to create and update their watch designs with the highest quality materials and components to Swiss precision. 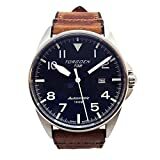 No wonder Torgoen has continued to roll out so many awesome watch collections into the marketplace, all the while polishing the image of pilot watches all the way. How & Where are Torgoen watches made? Torgoen has now been in the watch making industry for over 20 years, providing high quality aviator watches made with precision and accuracy using the best materials, components and production methods in order to pass with flying colours, the stringent Swiss watchmaking industry standards. All credits go to the design experts, expert watchmakers and professional users not to forget the top notch customer support. Torgoen source the best watch components worldwide, use reliable Ronda Swiss movements, aviation grade stainless steel cases and assemble the watches in Switzerland. Torgoen only use top quality materials with rigorous quality control of the product and its components at each and every stage of the manufacturing process. An in-house team of designers, technicians and engineers control the entire manufacturing process. 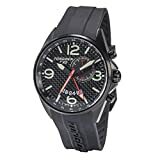 Torgoen believe in mastering their craftsmanship to the point where they feel satisfied to have created the best value aviation watches with uncompromising top quality design, materials and workmanship available in the watch industry. Before any Torgoen is released into the market, it undergoes strict quality control procedures at every stage of the manufacturing process so that they can easily withstand the test of time and extremely tough operating environments. Sure each Torgoen watch can endure the test of extreme temperature, humidity, dust, vibration and impact, they have evolved into top notch watches for pilots with suitable water resistance features. The styling speaks for itself as being inspired by modern cockpit environments. What is the Torgoen Warranty like? Torgoen has in its collections a number of watch series to fulfil the needs and requirements of customers. Below we have highlighted some series amongst the many themes available depending on your needs. The Orion series provides a great t solution for users to keep up with multiple time zones in their lives from the comfort of a single one timepiece. Living life to the full means that we are living in a global village and often find ourselves living and travelling to and from multiple time zones. Unlike other watches displaying 3 time zones, Torgoen take multiple time zones to a new level with easy to read contrasting straps and watch faces allowing for quick reading with a passing glance. The Swiss made Quartz Ronda mmovement with 12 hours dual time, high grade aviation grade stainless steel watch case holding a sapphire crystal glass is the perfect choice for the extreme aviator. For those of us looking for inspiration from a rugged fight plane there is the Scorpion series from Torgoen. Driving its inspiration from the P-51D Mustang fighter plane and encompassing strong, durable and unique characteristics. This is the iconic symbolism of the victorious United Stattes of America Air Force from the Second World War. The Scorpion series is equiped with some of the most complicated features in the watch making industry like for example the E6B flight computer which allows for quick calculations and conversions as well as the top class Ronda 6203B 12H Swiss movement. The T11 WASP line of Aviator watches are inspired by Female Airforce Service Pilots, giving it a unique style, fashionable quartz number, a Swiss made Quartz Ronda 5030.D movement sporting a 30 minute and 12 hour counter encased in a sapphire crystal glass cover. The added je ne sais quoi designing comes for aviation-enthusiasts who also love to give a little bling-bling wherever they go. The super elegant WASP collection is available in various case / watch strap colour combinations with and without gems to tone up or down you’re odse of bling. Torgoen are currently running more than 12 series in over 61 different versions including Torgoen Limited Editon watch. For experienced pilots, extreme sports enthusiasts, speed junkies and those who like deep water adventuring, Torgoen always has at its fingertips created a perfect balance of elegance and functionality to grace your aura. Choose the most eye-catching Torgoen watch from our up-to-date listings and save to the shopping cart before comparing with other watch brands on our site. Click on the links to check more in depth details including the lowest price available online from the best deals online. Before you know it you will find your new companion from the coolest Torgoen watches collections delivered to your door for FREE! 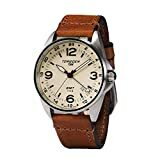 Regardless whether you are looking for Torgoen watches for women or Torgoen watches for men we have the best Torgoen watches reviewed for you so that you can make the best choice possible within your budget. We hope to have covered all the latest and best Torgoen watches in this watch review which has been bolstered with multiple owner/user feedback including the most striking pros and cons to help you make the best descision when buying your new watch. Be sure to read the user reviews to be able to pick up on points of interest that really do matter to actual wearers of top Torgoen watches. Many of these points are missed out by traditional review sites as these reviews are from watch enthusiasts who actually wear their watches day-in and day-out. Beleive me such users know very well the pros and cons of the watches that they have purchased. It might be a good idea to compare these Torgoen watches to other for useful reference and comparison to help to make the right decision. Yes there are hundreds of thousands of watches out there but not every watch is suitable for everyone. Torgoen Watches is a top watch brand proving to be going places. Use the useful features of WatchiWatches to help you shortlist your favourites watches before you make the buying decision with our trusted partners.